I can't even begin to express how much I LOVE the Prima Engraver line! The papers are FABULOUS! They are great for all projects, but I chose to scrap the men in my life with them because there aren't many lines out there that are fit for masculine layouts. This is a picture of my husband taken a few years ago in Death Valley at a place known as the Wandering Rocks, which is really weird! The rocks actually move, and because of the climate, they leave a trail. So, I used the Zutter distresser on all of the layers. I I folded and crumpled up the map paper, smoothed it out, then rubbed Distress Ink over the rumples. I did faux stitching to complete the background. The hanging vines and branch are from Memory Box dies. 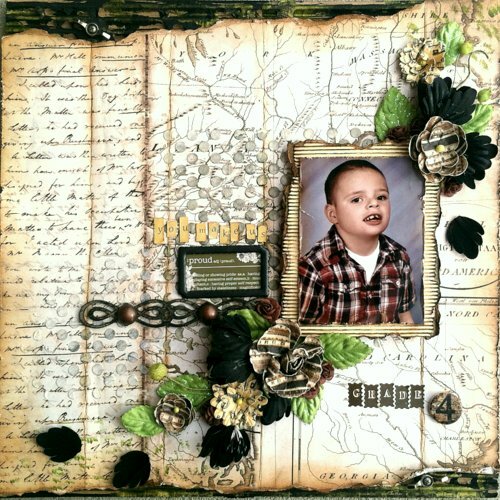 This layout is based on this month's Prima BAP. This is my son's school picture this year. I used a 12X12 cardboard base for the background- I ripped up the edges then painted it with black gesso, then with the Olive Vine Silks paint. I folded the paper to accentuate the lines that were already on the paper, then inked the folds. To complete the background, I used a Prima mask (polka dot) with Wendi Vecchi Embossing paste. (Seriously, this stuff is amazing- if you have trouble getting crisp images from your masks, this complete solves the problem.) I used a piece of Blue Fern Studios border coming from the bottom of the picture. These feet are my youngest's taken when he was just one month. 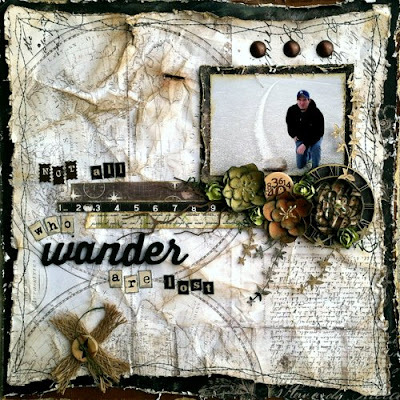 To get that background I cut the papers in a wavy motion, then distressed the edges with a tool, then my fingers. I used that same technique with the photo mat. The heart punch is from Martha Stewart, and the vines are chipboard from Blue Fern Studios. Rae, your layout are beautiful as usual. Gorgeous Layouts Rae. I so love the one of Owen. Love how you did the background with the cardboard. OMG Rae..... these are soooooo STUNING!!!! Every single page is Gorgeous but the last one..... sigh..... BREATH TAKING!!!! !